Sfinkx Fusion solar kits are available as 5 kW, 7.5 kW and 10 kW complete photovoltaic (PV) power equipment kits, designed specifically for residential and commercial applications. Each Fusion kit is pre-engineered to optimize system performance and meet applicable NEC codes and requirements. The Fusion kit’s quality components and detailed installation, operation and maintenance manual makes it easy for licensed electricians and licensed solar contractors to install. All kit components are ARRA compliant and American made at the our manufacturing facility in Lake Mary, Florida. Sfinkx’s PV modules are one of the world’s most efficient PV modules on the market today. We are committed to leading the industry with innovations and cutting edge technology advancements to help make renewable energy more cost effective. The grid-tied solar inverter offers market leading efficiency and voltage operating range maximizing energy yield to provide superior performance in low light and high temperatures. 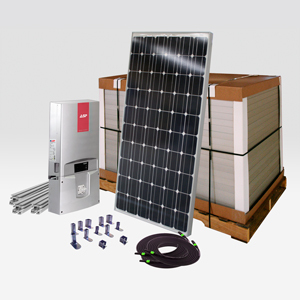 The integrated PV system AC/DC disconnect switch saves installation time and cost. The SunRail™ PV Module Mounting System is designed and engineered for residential, commercial and utility applications. The metal extrusion components are a pure composition of aluminum alloy making it stronger and more durable. The racking system provides engineering for non-penetrating and penetrating systems on standard shingle, flat and tile roofs as well as ground mounting solutions.